I received a request from a galanthophile to feature a snowdrop on BPotD, so here's one from UBC. 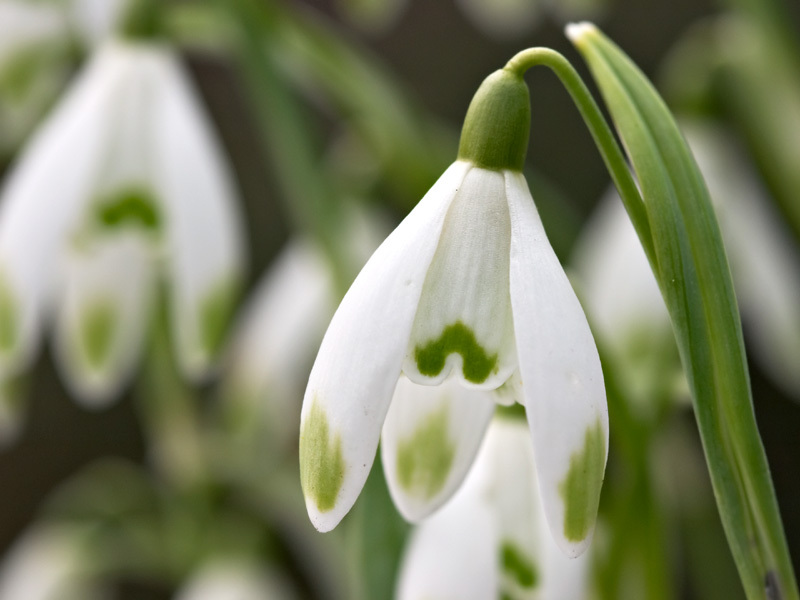 The UBC garden has a half-dozen or so different kinds of snowdrops, a number that pales in comparison to the roughly one hundred and sixty different cultivars at Colesbourne Gardens in the UK. With that many cultivars, you might expect a large range of forms and sizes. The reality, though, is that the differences between cultivars can be extremely subtle. The requirement to appreciate detail and subtlety is part of the attraction for galanthophiles. Snowdrops are native to Europe and Asia Minor. As M.J. Harvey writes in a book review of “The Genus Galanthus” for Botanical Electronic News No. 250, that distribution resulted in a delay in the scientific understanding of the genus. Scientists on one side of the Iron Curtain did not have ready access to the live plants or herbarium specimens from the other side (and vice versa), so no one could compile a complete overview. This changed in the 1990s, facilitating the taxonomic work required for (and subsequent publication of) the monograph of Galanthus reviewed by Harvey. Botany resource link: A biography of Dr. Katherine Esau, pioneering plant anatomist (yes, she did write the textbook on the subject!). A fascinating story of an accomplished scientist. I noticed pots of this for sale at the Shop in the Garden this week. okayy how is this plant used historically and howdo other cultures use or used this plant as medicine? are there side effects of using this plant as medicine? when was the medicine dicovered?